The last week was tough on both bond and equity markets around the globe because central bankers were trying to provide "forward guidance" to the market. 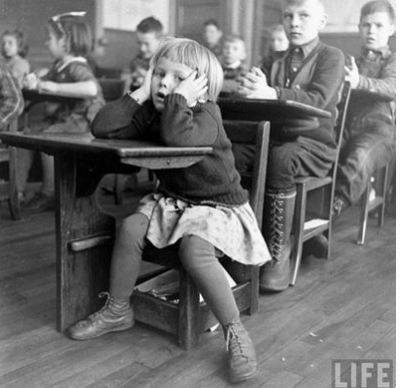 Central bankers speak and the market will listen and react. Now, different speeches will have different levels of guidance. For example, FOMC minutes have a lot of formal guidance while a Fed president speech from a non-voting member of the FOMC will be given little weight. Nevertheless, all talk will be given some value by the markets. Unfortunately, the message, in any given central banker statement, may not be heard "correctly" by the market. Hence, markets saw strong price reversals this week in reaction to president Draghi's comments and then ECB clarifications. Policy desires and prices may diverge when we have a failure to communicate. Communication failures will punish the markets. This divergence is more likely when the central banks are not trying to provide more than just an appropriate level of liquidity to sustain economic growth and control inflation. Central bankers want to potentially control bubbles and impact the supply and demand for assets through their balance sheet activities, so markets are more sensitive to any comments. Any comment on valuations and balance sheet changes will be taken seriously and in a manner that is often violent. Think taper tantrums. With central banks potentially cutting liquidity, markets will be biased toward thinking the worst which mean trend reversals. This failure to communicate the right message will generate volatility that will especially hit traders who are risk sensitive to changes in market trend. 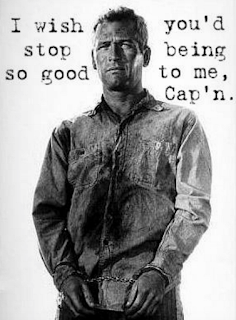 Central bankers, please stop being so good to us! How many times have you recently heard, "My hedge funds are not generating enough performance relative to my equity portfolio. Why am I holding this stuff?" The answer is simple. It provides diversification. This diversification can be across markets, time-frames, factor sensitivities, and styles of return generation. Diversification by its very nature means that there will be performance differences and return gaps. A well-diversified portfolio will have assets that do not move together, so it should not be surprising that if an asset is added to generate diversification it will not match the core performance of equities and bonds. 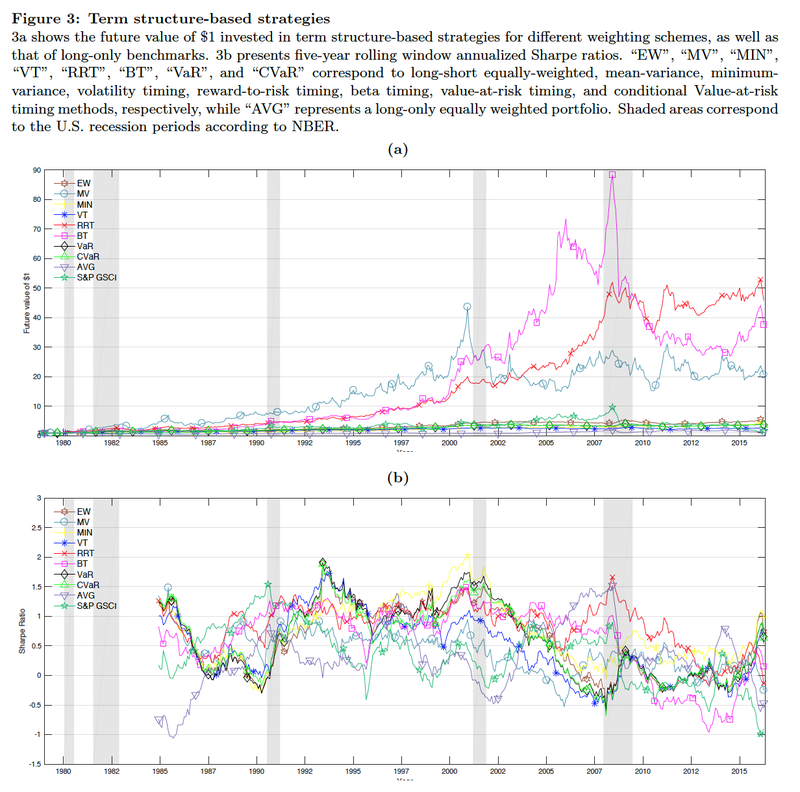 If performance across portfolio exposures si similar, diversification was not achieved. Nevertheless, if the correlation between two assets is negative, it does not mean that if the return of one asset is positive the other will be negative. Many often confuse deviations from mean returns, the core measure in covariance, and absolute performance differences. The correlation is the covariance of two assets scaled by their standard deviations. The covariance is the relationship between the deviations from the mean of each asset. Hence, you can have positive correlation and a wide gap in performance between two assets or you can have a negative correlation with little gap in assets. Still, if there is dispersion in returns, both good and bad across asset in the portfolio, then the diversification is doing its job. Learn to relax about differences in correlation. It has been a tough period for making money in commodities especially if you have been a long-only index investor. When the super-cycle turns down, there is no place to hide even trading from the short-side has been challenging. Both momentum and carry-based approaches for finding opportunities have suffered during this period of prolonged decline; however, there may be hope for investors through using different portfolio weighing schemes when building commodity portfolios. 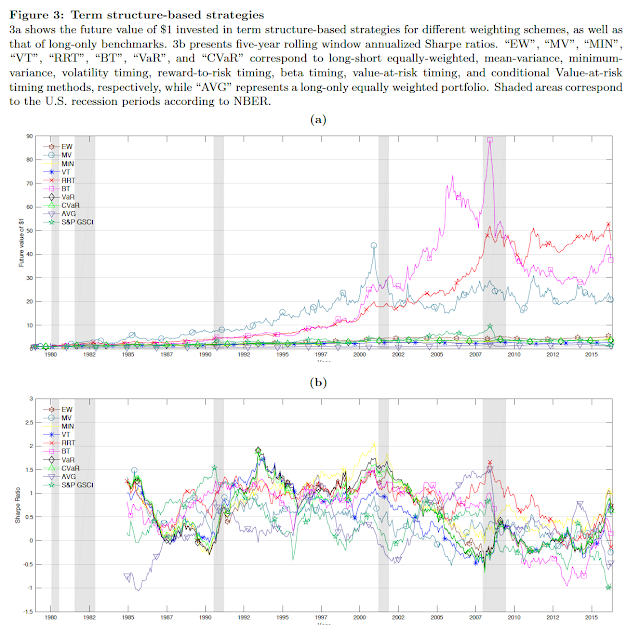 A recent paper which analyzes different approaches to weighing momentum and carry shows that there can be significant gains in return and information ratio relative to a commodity index and an equal weighted portfolio. 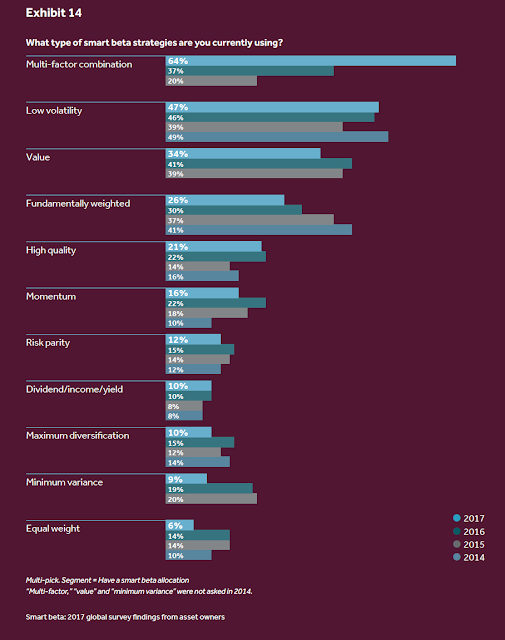 See "How do portfolio weighting schemes affect commodity futures risk premia?" 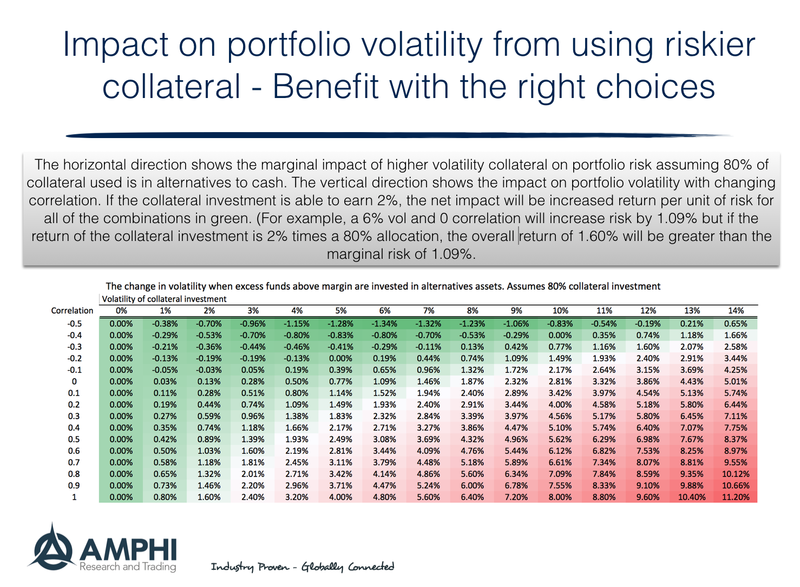 We will show some of the results from this research, but first it is important to provide an intuitive feel for why different portfolio weighing schemes may work. Fact 1: Volatility is high and variable and correlations across commodities are lower than what will be found in other asset classes. There is more benefit from weighing and adjusting to volatility than if correlations are high and volatility is stable. Fact 2: Momentum seems to work in commodity markets, but performance will be affected by the changing volatility. Fact 3: Backwardation and contango as a carry strategy is effective, but it can be swamped by large up or down price trends. Conjecture: Using dynamic portfolio weighting schemes may have the ability to improve performance through adapting to changes in the covariance matrix. The performance profiles and Sharpe ratios show the clear impact of sizing the portfolio properly. The sizing matters even if you are using the same return generating engine. Using different weighing schemes with carry and momentum will improve significantly performance relative to an index. Adjustments and rebalancing is done monthly without any risk management schemes. Be a timer or minimize portfolio risk, but don't sit on the sidelines with passive commodity investments. "I only take trades that have an expected return to risk of 3:1 and my average risk position .5 to 1.5% based on my conviction. I expect to generate mid-teens returns with a 10% vol..... bla, bla, bla...."
This is pretty standard language for many traders describing their strategy, but some of it does not make sense when you look through the numbers, or at least a careful look at the numbers will tell you what has to happen for this all to be true. This is where simple cases of imprecise language can lead to confusion. Investors may have problems with understanding what a trader means if all the assumptions concerning trading are not well-defined. Here are some questions that an investor may have when hearing the above phrases. If you only take 3:1 return to risk trades and your volatility is 10%, then does this mean your return should be 30%? The idea of risk and return for a trade have to be made precise. If you only generate a 10% return in reality, does this mean that 2/3rds of your trades scratched with no gain? An ex ante 3:1 trade is not the same as ex post returns. Does it mean that your 3:1 trades were actually only 1:1 trades? The translation from trades to portfolio returns is not always easy to describe. How many losing trades did you have? 3:1 trades only give you half the story. Investors need to know the outcomes. How many winners were there of those original trades? If ex ante you expect 3:1 trades, what is your success ex post? I might prefer 2:1 if your success rate is better. If your average risk position is between .5 and 1.5%, you have to come up with a lot of good 3:1 trades to make money. How many "3-baggers" are out there? How many good ideas can one trader come up with in one year if you will only take 1% risk per trade? Assume you take 1% positions; if you take 100 position, you will need a fair number of successful trades to hit anything close to a 10% return. How much are you willing to lose for those 3:1 trades? How long will you wait for those 3:1 trades to be realized? 3:1 trade over different time frames makes a huge difference in returns. Using the fundamental law of active management, what does it mean when you say you take 3:1 trades? How many trades do you actually have to take? The fundamental law states that the information ratio is equal to the information coefficient or selection skill times the square root of the number of investment opportunities. Efficiency, the information ratio, is equal to skill times breath. A trader needs a lot of independent trades to make money independent of a benchmark. Obviously, this original comment can be decomposed and carefully studied to show the potential returns under a number of alternatives. Our important point is to focus on the ambiguity and imprecision of language when these terms are used. Don't take what is said for granted. In an earlier post we discussed the issue of using capital more efficiently in a managed futures investment. The premise is simple. If only limited funds are used for margin, the majority of cash associated with a managed futures investment are held in low interest investments. 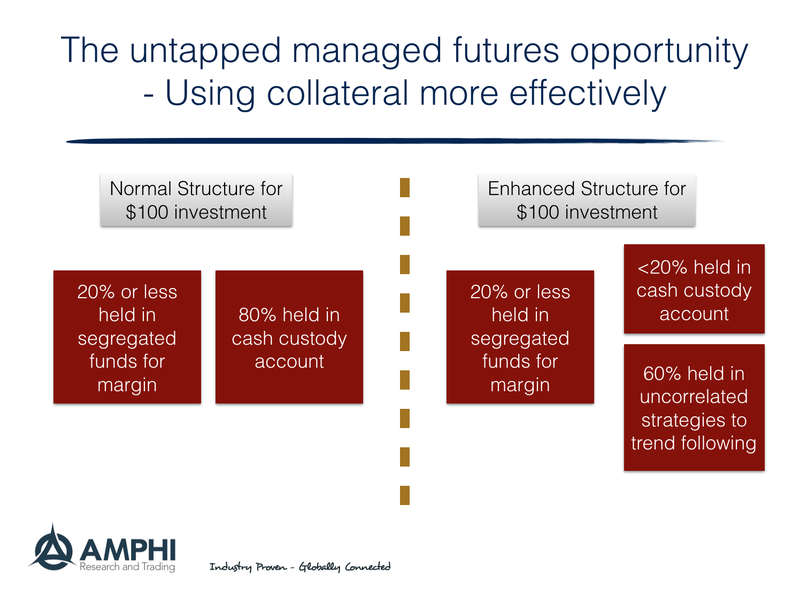 This portion of the managed futures capital can be better deployed to increase returns. Similarly, managed futures can be used as an overlay to an existing portfolio to better use cash. See "Use your collateral wisely and enhance managed futures efficiency". In this post, we use a simple example to look at the trade-off of risk and return when using the collateral more efficiently. We take a simple combination of two assets, the managed futures portfolio and the cash portfolio which we have set at 80% of the funds invested. Our example starts with a managed futures fund that has a 10% volatility in the table below. With the collateral investment in cash, the marginal increase in volatility is zero, so the volatility of the fund is just the risk associated with managed futures trading positions. Any movement of funds away from cash will be affected by the volatility of the investment and the correlation between the managed futures trade portfolio and the collateral investment. We can first determine the volatility of the overall portfolio when there is an investment in a trading account and an alternative cash account. From this number we can subtract the volatility of the portfolio that just holds cash for collateral. This will tell us the marginal increase in risk from holding alternatives to cash at different volatility and correlation combinations. This matrix can be changed to a smaller investment of collateral to, say 40%. In that case, the marginal change in volatility will be lower as well as the increase in return. If you invest collateral in a negatively correlated asset, there will be a decrease in overall volatility. If there is an asset that is liquid and can be negatively correlated with the trading account, the fund volatility can be decreased and returns can be increased to improve the fund information ratio. If there is an expected return from the collateral investment, the investor can determine what is the volatility and correlation combination necessary to have a positive marginal information ratio. This post shows that collateral management can be analyzed in a systematic manner in order to explore issues of fund capital efficiency. The Northern Trust/EIU Transparency in Alternatives Investing Survey 2017 focuses on some important investment considerations from investors around the world. Once again the most important issue seems to be the degree of transparency provided by managers. This applies to both traditional and alternative managers. An investor needs to know what he is buying when he gives money to a manager. Funds are entrusted to others. The purpose for this transparency is very clear - understanding the degree of risk being taken. Transparency on a simple level means information. 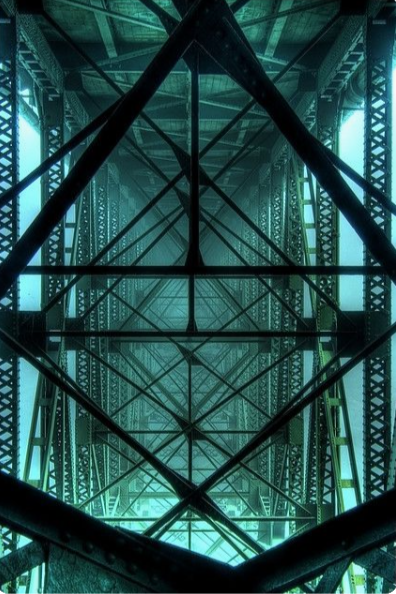 Investors want to know the contents of the portfolio and the foundation of the investment process or style, but the degree of risk is more complex issue. You may have the information, but you may not know the actual risks within the portfolio. The true demand of investors is with interpreting the data. What are types of risk being taken? What are the risk premiums being exploited? How will the portfolio react to changes in the investment environment? 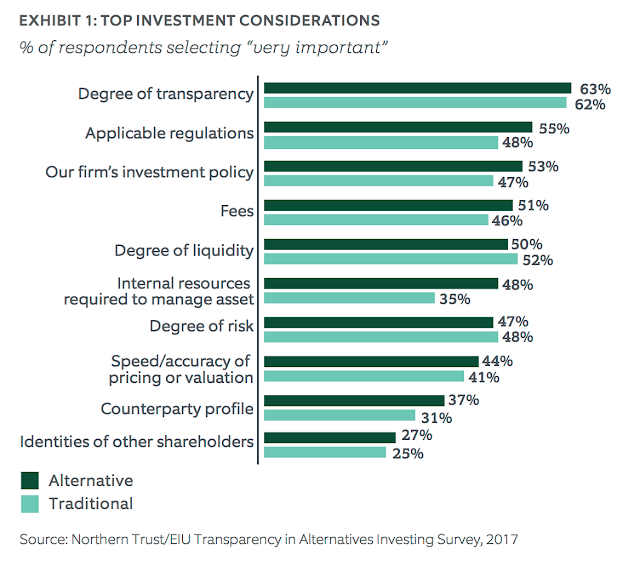 Transparency is more than information but clarity with the expected behavior of the manager and the types of risks hidden when securities are aggregated in a portfolio. Managed futures investments have the key structural feature that they do not use leverage in the sense of borrowing money to increase notional positions relative to cash. In most cases, margin requirements are a small fraction of the capital invested in a program or fund. A managed futures fund may only use less than 20 cents on the dollar for margin while 80 cents or more may be held in a custody account at close to zero interest rate. Nevertheless, some managers are more aggressive and may hold funds in an enhanced money fund or short-term bond fund to add to return. Of course, some investor will use a separate account and only provide funds for margin with a cushion. This cuts the excess cash held by the manager. Generally, capital is not used efficiently with this hedge fund strategy. By efficiency we mean that returns can be enhanced by deploying more of the money in the fund in investments that have a return higher than cash. This will have an impact on overall volatility, but this can be managed to still target a specific volatility level for the fund. A simple way of more efficiently using the capital is to employ managed futures as a overlay program so that all of a portfolio's capital is used to generated the highest returns possible. The notional trading size of the overall portfolio will be higher, but the volatility of the overall portfolio can still be managed to specific volatility target. 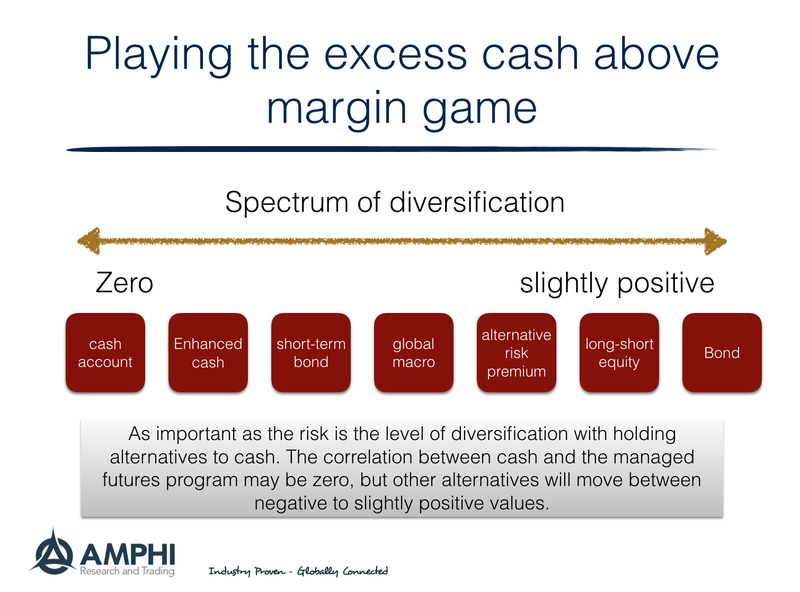 There is both potential benefits and costs with using the capital that is held in cash based on the correlation between the managed futures program and the choice of investment for the non-margin funds. If the funds are held in an asset or strategy that has higher volatility than cash, the net result may be an increase in the overall volatility of the fund. The portfolio volatility will be based on the combination of the volatility for the cash component and the correlation with the futures program. An investor may not want to pay for the higher volatility or return that is not associated with this use of the cash; however, that is an issue of negotiation between the manager and the investors. 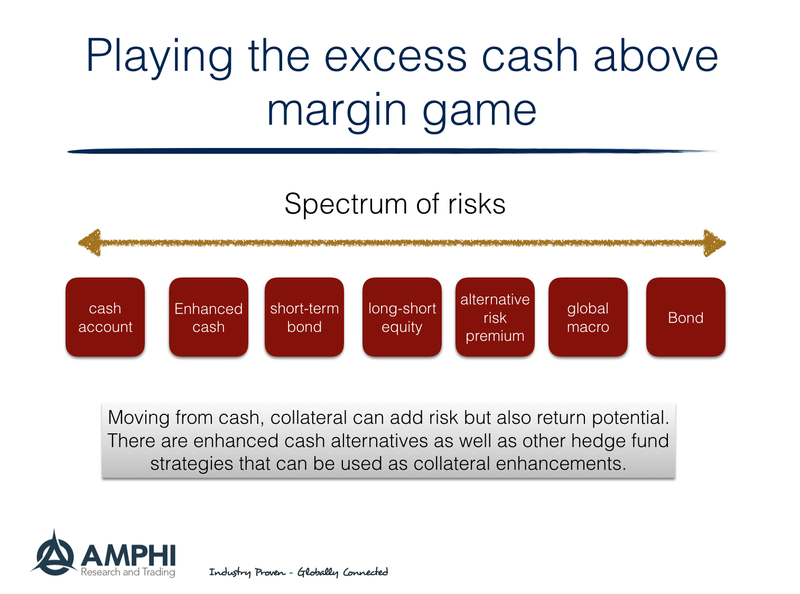 The cash component decision can be thought of as a continuum of risk and return with the base position being cash which has no correlation with the managed futures returns and has limited or no return. The manager or investor can move out the risk spectrum for the collateral usage. However, the impact on overall volatility will be related to the correlation between the collateral account and the managed futures program. If there is a negative correlation, the enhanced collateral may actually reduce overall program risk. 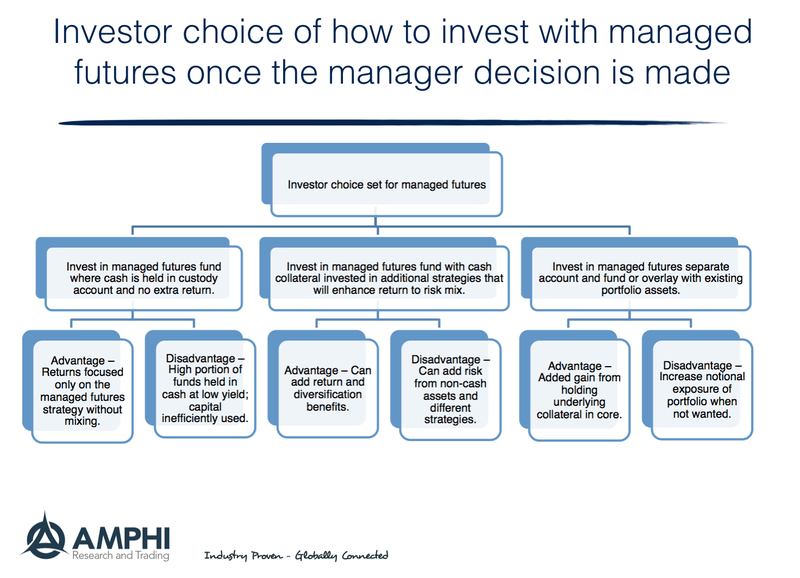 The choice set of how to employ managed futures and efficiently use capital is fairly broad but can help widen the return opportunities for both manager and investor. Holding cash may be the best alternative but that decision should be made after looking at all of the choices for excess collateral. 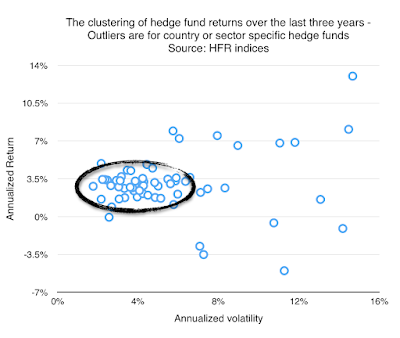 Clustering of hedge fund returns - where is the difference? 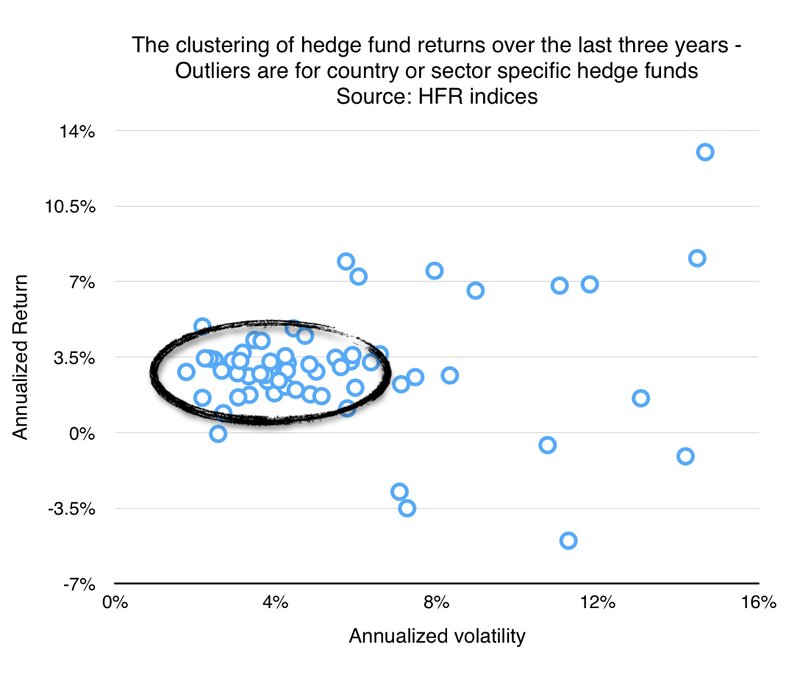 A close look at all of the HFR hedge fund index returns over the last three years shows a significant amount of clustering of styles with the only outliers associated with country and sector indices. For 60 indices, the average three year (May 2014 - May 2017) annualized return was 3.04 percent and the average annualized volatility was 5.61 percent. Outliers are focused on sector indices like technology and energy and country or regional indices like India or Latin America. 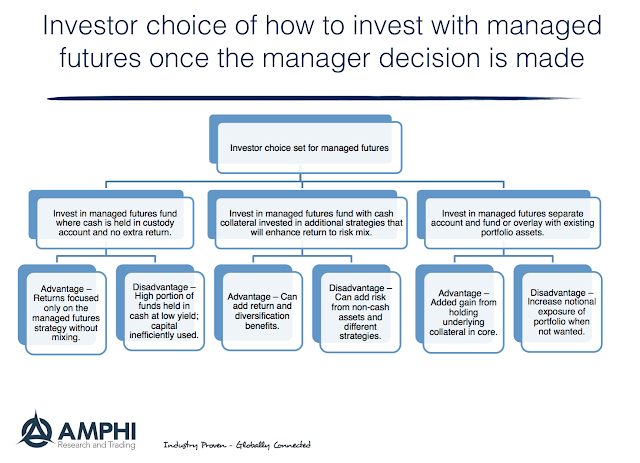 The quest in hedge fund investing is to find managers who do not fall within the cluster but can generate better returns. Of course, the range of return and risk would be wider of individual managers but if you had to start with a simple judgment of what you will receive with a portfolio of hedge fund managers it is likely to be closer to an information ratio of .6 and a return and risk of 3 and 5.5 percent. These numbers are dynamic, but they are a long way from the expectations that managers provide information ratios above one and annualized returns over 10 percent. 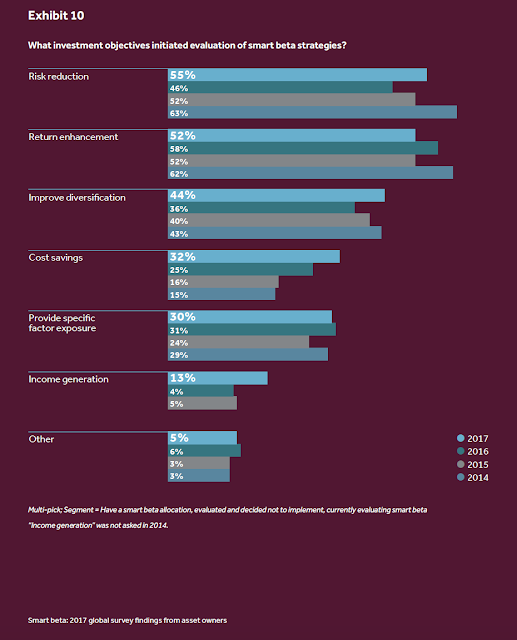 The FTSE Russell annual survey on smart beta does a good job at describing trends in investor thinking with respect to this growing area of portfolio allocation. Smart beta is extending its breath and reach to other asset classes as well as a wider selection of risk premiums and formats. What is still clear is that investors are looking for smart beta in all forms to help with risk reduction and improve diversification. These are the number one and three reasons for holding exposures. Nevertheless, the fastest growing investment objective is cost savings. It is likely that smart beta is being used as a substitute for more expensive active management. The number one smart beta strategy is a multi-factor combination with low volatility and value coming in second and third. There is a clear investor bias for having factors blended under the name of smart beta. This desire for multi-factor combinations gets to the heart of one of the key issues of smart beta. At what point is smart beta allocated across a number of factors quantitative active management allocated across a set of strategies through a set of rules? The lines are blurring and this will have an impact on the costs and demand for active managers. The active manager will have to prove whether he is smarter than a smart beta portfolio. Can momentum and diversifications solve every investment problem? Perhaps. I listened to a number of presentations concerning crisis alpha and crisis offset at a recent hedge fund conference. 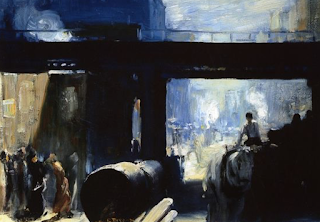 The idea of holding assets and strategies that will do well in "bad times" is a critical issue for any portfolio construction discussion. It is the bedrock and foundation of any portfolio that attempts to protect against bad states of nature, control risk, and gain during good times. 1. Diversification - Loses will always be less even if correlations increase during a crisis if there is a well diversified portfolio in place. Nevertheless, diversification is not a "one size fits all" solution. The level and choice of diversification is an active decision no different than the choices made to increase return. Diversification is an active bet on correlation and volatility. While not oversimplifying, different asset classes and strategies have different responses to "bad times" or crises. Hence, the cross-asset returns and correlations will change with the business cycle and with changes in the financial environment. If there is the expectation that crises are more likely, investors should be increased demand for assets that have characteristics of negative or low correlation during these states. 2. Momentum - Increase allocation to winners and cut exposures to losers. This is the simplest form of momentum. The next level of momentum trading is to short losers. Everything else could be considered just extra to portfolio construction. Of course, there are numerous ways of measuring winners and losers and there can be wrinkles based on forward expectations, but the concept is still very straight-forward. Momentum may not predict a crisis, but if a crisis occurs, momentum will help any investor to get on the right side of the market move. The adjustment from momentum occurs without even a clear view on the how or why a market declined. It is non-predictive and simply responsive to market forces. In a macro sense, momentum adds the equivalent of option gamma to the portfolio. 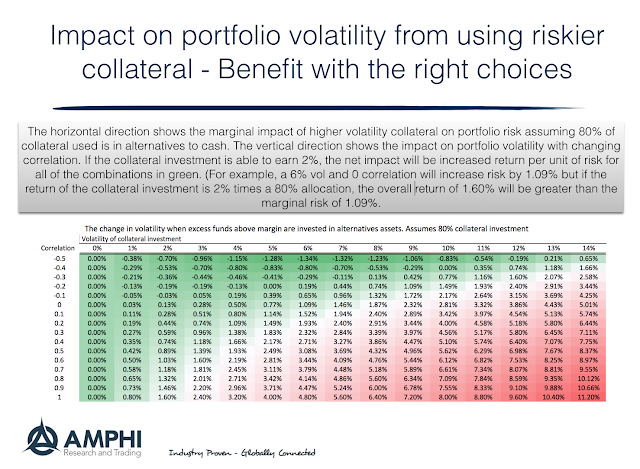 Risk manage the portfolio - Allocate based on volatility (higher volatility tied to lower risk exposure). Target volatility so that if correlations move to one there is a cut in overall risk exposure. If the momentum signals will not adjust fast enough to market directional changes, then use stops to exit the market. Asset management may not be that simple in reality, but it can be that simple in terms of guiding principles. If in doubt of what should be done in any situation, the guiding principles of diversification and momentum can serve as a first pass for construction. There has been much discussion about benchmarks and beta with hedge funds, but it is important to take a step-back and discuss how active returns are generated. 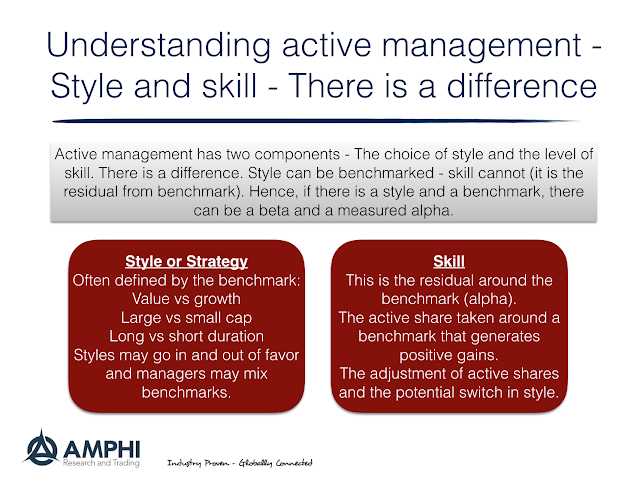 Active management can be divided into two parts, the style used and the skill employed within that style. You can call a style a risk premium as is the case for value or small investing; however, all returns from styles may not be from risk premiums. Style is simply a descriptor or means for generating returns. Skill comes with the method of employing the style. 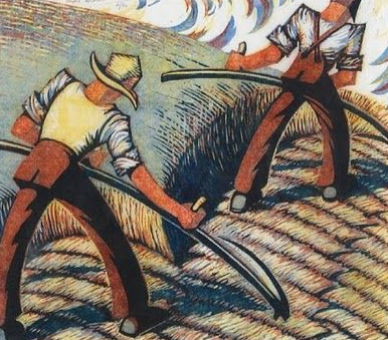 Within a style, some managers are better at it than others. 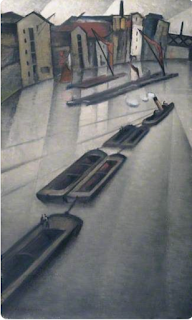 Styles will differ because they attempt to capture different return streams. A value investor will be different than a global macro manager because they are attempting to find different return phenomena. A momentum manager will clearly be different from merger arbitrage. If the style is not associated with a clear risk premium, then it may have to be measured by a peer group. In this case, skill is ability to beat the average of a set of peers. Styles may go in and out of fashion no different than risk premiums may be time varying and change with a market or business cycle. Hence, there can be a skilled manager within a style, but if the style is generating poor returns, the manager's skill may not be able to offset the negative style effect. Finding the best may not be good enough. Style choice and diversification matters. Some will say choose your manager wisely. Perhaps more important is choosing your the styles for your portfolio wisely. Quants vs. 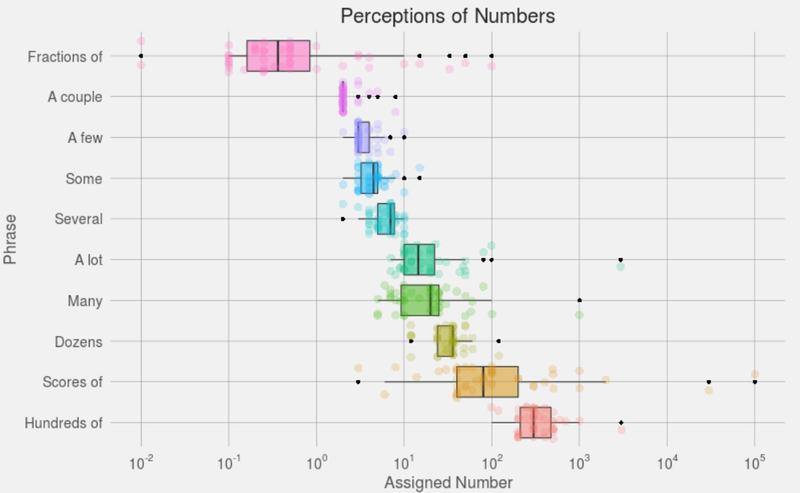 Discretionary - Numbers vs. Story - Is one better? Most of our quants have a computer-science background. They can code in either Python or C++. Whereas on the discretionary side most of them come from a more traditional investment-banking background and are digging into 8-Ks and company fundamentals and being able to look at companies from a bottom-up perspective as compared to trying to use many different data sets to help predict the prices of stocks. As the old joke says, "There are only two types of people - those that type others and those who do not." However, this dichotomy may be applicable for current money management. There are two camps of analysis, the quants who are looking for repeatable behavior in data and the discretionary analysts who are looking for unique or special situations across markets. The quant plays the averages and the probabilities while the other places value on what cannot be counted and handicapped. 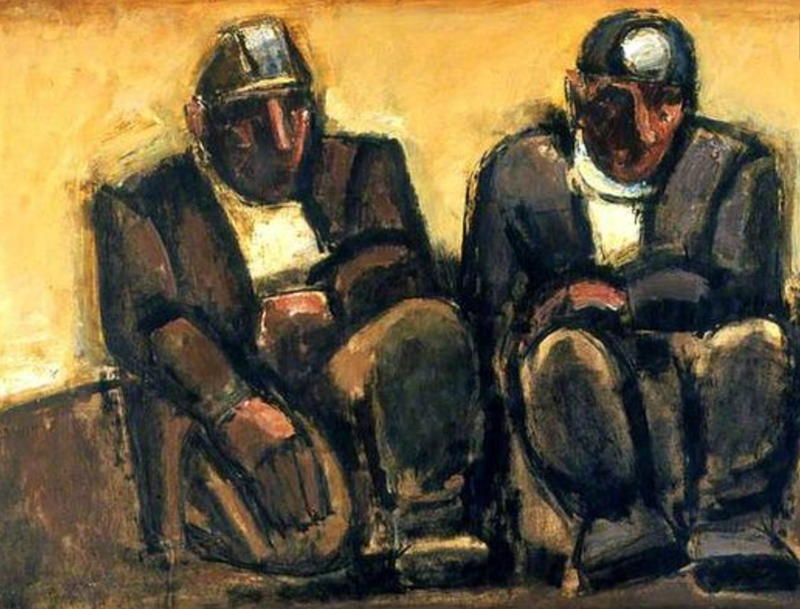 One focuses on the numbers while the other looks for the firm story as a thesis for investing. Is one better than the other? I would say that it depends on the problem to be solved and the market to be analyzed, or whether the focus is on counting or the focus is on uniqueness. There is a continuum on research processing. At one extreme will be the focus on large data and an analysis of statistical relationships based on counting versus the other extreme where there is little data that is countable and research requires looking for similarity or a limited number of cases. An example of a countable market will be the mortgage-backed securities. There is a lot of data to measure relationships. An example of a countable style will be statistical arbitrage. The alternative is a style that is based on "newness" or a market that has limited data A case-based approach is more applicable for analysis of tech firms and an example of a discretionary style based on uniqueness may be deep value. The approach to research and analysis is affected by the choice of markets and style. In case-based approach, there is a premium on story-telling. The research approach matches the sale and market. 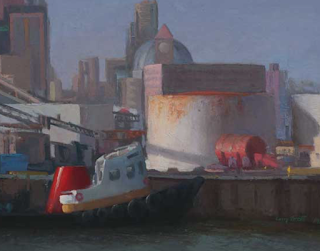 There are reasons for quants focus on some markets and investment-banking types focusing on others; however, an interesting intersection will be those researchers that can marry numbers with story-telling. “March Hare: …Then you should say what you mean. Alice: I do; at least – at least I mean what I say — that’s the same thing, you know. Hatter: Not the same thing a bit! 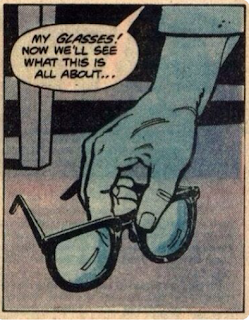 Why, you might just as well say that, ‘I see what I eat’ is the same as ‘I eat what I see’! March Hare: You might just as well say, that “I like what I get” is the same thing as “I get what I like”! I meant what I said and I said what I meant. An elephant’s faithful one-hundred percent. - Dr. Seuss book “Horton Hears a Who”. When managers or investors use language, there can be a significant amount of uncertainty in what meant. There is little precision in language so quantitative analysis provides more details in the highly competitive money management field. This issue of imprecise language was first discussed by the CIA analyst Sherman Kent who identified the problem in the reporting by other analysts. If someone says that an event is "likely" what does that really mean? Sloppy language leads to sloppy thinking. We have discussed this issue in the past in our posts Sherman Kent - the godfather of precision in forecasting language and What does failed intelligence tell us about investing, but we came across an enhanced analysis based on survey work. 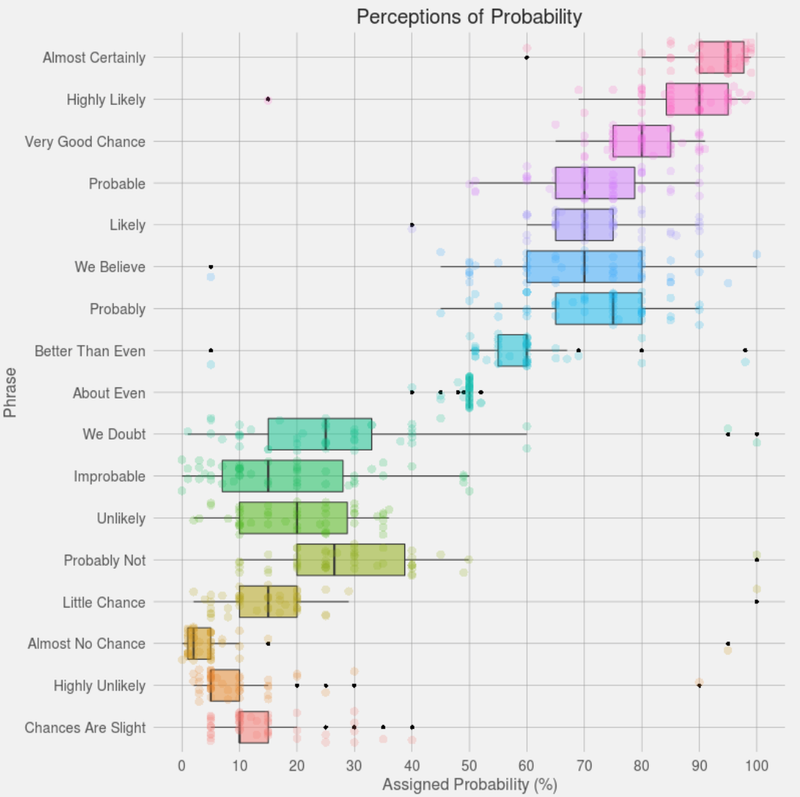 A large number of people were asked to provide probabilities to different word phrases. This information was translated into these beautiful graphs. See these posts for more information on how the graphs were constructed. Look at the high degree of uncertainty associated with these phrases. Be warned; someone who tells you that something is unlikely will still have a median of 20% chance of occurring. A probable outcome has only a 70% median with a range of plus or minus 20%. The same problem applies with perception of numbers. A lot could mean anything from 10 to 100. Scores could be close to 100 but range from less than 10 to 100,000. 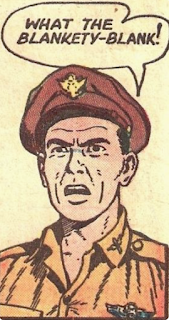 The operative phrase is "watch your language". How many times have you sat in on an investment meeting only to have those around the table use "squishy" language which has no meaning? (I have been to dozens.) It is a fine way of avoiding accountability. Of course, numbers can be used to provide a false sense of certitude, but given a choice; I will take the precision of a number. The number can be checked and verified. The lesson from "super forecasters" is that the process of adding precision to a forecast improves the forecast. 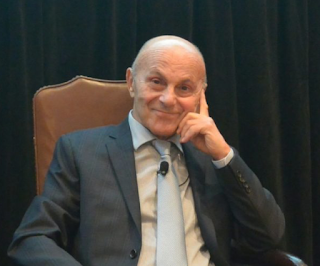 “Momentum is a big embarrassment for market efficiency,” he proclaimed, saying he “hopes it goes away” and that the concept was “not exploitable.” - Eugene Fama from CFA Society of Chicago keynote speech. You cannot help but think about Thomas Kuhn and The Evolution of Scientific Revolutions when there is now a discussion of market efficiency. During the 70's and 80's market efficiency studies "proving" this hypothesis took the field of finance by storm only to have alternative studies and work chip away at the theory through the 90's and 2000's only to currently be relegated to a simplifying assumption or a view as "frictionless" market. Thousands of finance students and MBA's were indoctrinated with the idea that markets were efficient. We now have behavioral, limits to arbitrage, transaction costs, agent-based, and time varying risk premium stories to explain momentum and trends in prices. The theory of finance is much broader and those that were efficient market supporters have had to adapt and change their views. Still financial markets are competitive. It is hard to make money in money management. Few have been able to beat benchmarks. Passive low fee investing is a good investment starting point. Perhaps excess returns are mainly compensation for the hard work of finance or the compensation for risk. Nevertheless, the momentum and trend-followers who were outside the mainstream can take pride that their efforts were not in vain. They were rewarded with profits and now the knowledge that those that said it was not possible have to eat crow. Should I care if a managed futures fund has a five-star rating? So you see a manager with a good Morningstar rating. It has five-stars. Should an investor care? Past performance is not indicative of future returns, so should it matter if you had highly rated past risk-adjusted performance? Certainly, a rating is not definitive, but as a heuristic on a fund's relative performance, there is positive information to be gleaned from ratings. 1. The Morningstar rating is done over a minimum of 3-years so it provides historical perspective. 2. The Morningstar rating is based on risk-adjusted returns that account for utility and not just standard deviation. Hence, it offers and alternative view relative to rankings by Sharpe or information ratios. 3. The rating is based on a category classification, so it is related to peers. 4. The 5-star and 1-star ratings each represent 10% of the sample, so it is hard to maintain over long periods. 5. Investors will both punish and reward managers when there is a change in ratings. There are abnormal flows when a rating changes. 6. 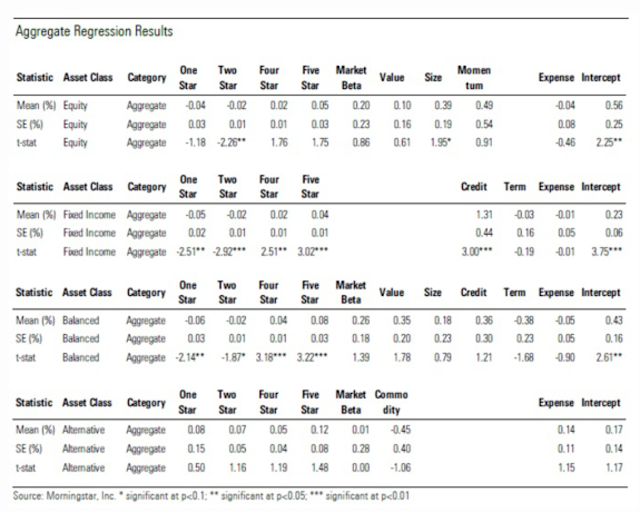 A 1990's study show that 5-star mutual funds have a fall-off in performance after the rating is given and there is higher risk after the rating is announced. 7. Low-rated funds do predict future poor performance. Higher-rated funds may not outperform the next lower rating category in the future. 7. Mutual fund managers that receive low ratings are likely to be replaced. If you expect the 5-star funds to always stay as 5-star funds, you may be disappointed given the 10% star threshold. The signals on performance are mixed, yet the most exhaustive study from Morningstar done last year shows that the rating does make a difference. See the research piece by Jeffery Ptak. There is value in the rating even after accounting for the standard four-factor model in equities. There is also value from a high rating for a fixed income and balanced funds even after account for other risk factors. However, the value associated with alternative investments is not as statistically significant. The author argues that this may be caused by a smaller sample but the general take is that star rating has some marginal meaning. Research has also found that rankings and performance are tied to costs. Lower cost funds will naturally have an advantage relative to higher cost funds. A closer analysis may show that the more dispersion around any benchmark will reduce the impact of costs as a driver for rankings. Hence, in alternative investment category where there may be more dispersion around an benchmark and there is less agreement on the benchmark, cost impacts will be less. Still, when in doubt look for lower cost alternatives. Can this be related to choosing managed futures or alternative investment funds? As a heuristic to help identify potentially better funds, the rating system may be a useful first pass. It is a not a substitute for more exhaustive analysis but there should be strong reasons to bet against the best and worst funds regardless of asset class. Asset class performance - The "Global Rotation"